Further to my previous post about 1930s two toned hair....STOP the PRESS! I just found a 1935 article discussing coloured hair! Featured hues of that season included PINK and BLUE!! 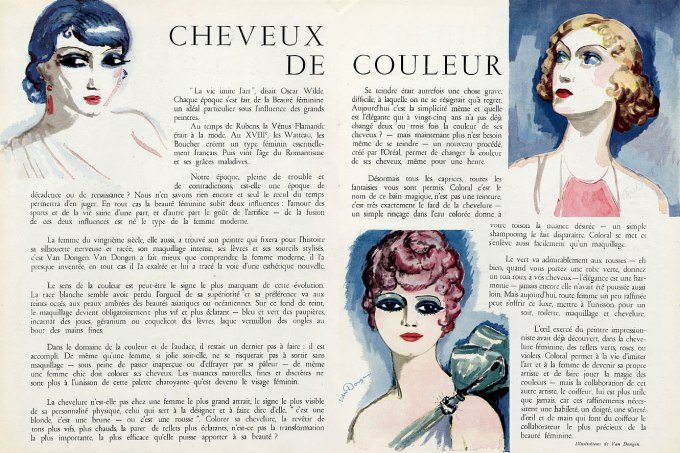 I love how this article talks about that the two defining spirits of the age (c. 1930s) that this era's feminine beauty ideals centred around were: 1) a love of sports and healthy living and 2) a taste for a certain kind of more elaborate (read 'made up' and/or ornamented) aesthetic (that's how I translate the use of the word 'artifice' here. It argues it is these two influences that have given birth in a sense to the modern woman of the '30s. Fascinating. That's why I love the 30s so. This is so great! The 30s are the era that most people forget about, or just think of as "the great depression" in the states. It was far more than that! You do make a great point, Solanah! And a great reminder, too, that the 1930s was a complex and contradictory period, depending on which social class and which demographic area you were from at that time? It wasn't all deco glamour or dustbowl devastation for every person. Of course this is clearly a pretty swish 30s magazine, filled with ideals of beauty that really only the wealthy could afford, I'm sure. xo! Imagine that pink hair with a pink satin jacket from Schiaparelli's Circus collection! THE. LIVING. END! Great article, thanks for posting. How fab! Might have to bust out my french and try and read this article later. So amazing, would love to see some real life pictures of 1930's ladies with colourful hair. That's awesome! I often feel a little odd wearing vintage styles with brightly hued hair, but no longer - now I can just tell people I'm channeling the 1930's. :-) Thanks for sharing! I LOVE this! Learn something new every day :) Thanks for sharing! What a delightfully interesting glimpse back into the hair fashions of the past. Yay! As a person whos wears 1930's fashion and hair dos and usually has hair colours like pastel blue, purple etc this pleases me greatly!!! When I was in high school, I really wanted blue hair. Maybe it's time to revist that dream.